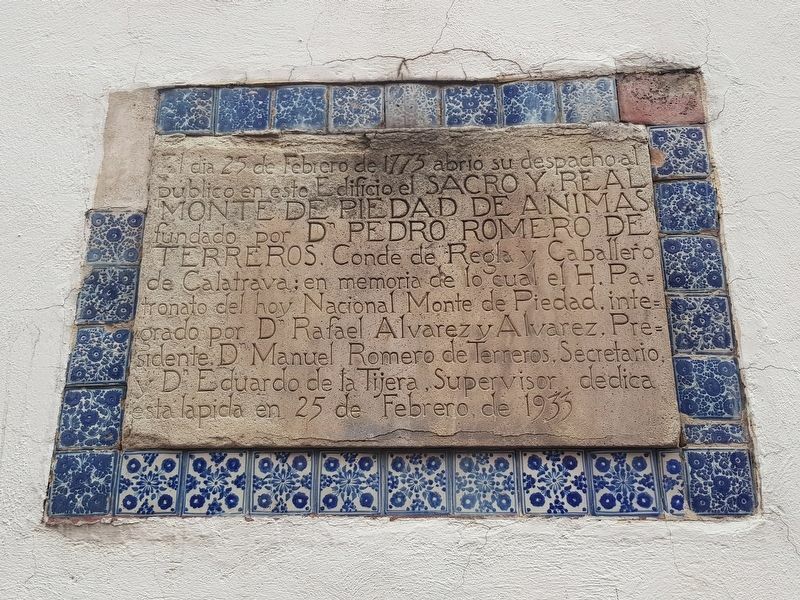 On February 25, 1775 Pedro Romero de Terreros, Count of Regla and Knight of Caltrava opened his office to the public in this building as the Sacred and Royal Monte de Piedad de Ánimas. In memory of this event the Honorable Board of the present National Monte de Piedad, presided by Rafael Álvarez y Álvarez, President, Manuel Romero de Terreros, Secretary, and Eduardo de la Tijera, Supervisor, dedicates this marker on February 25, 1933. Erected 1933 by Honorable Patronato del Nacional Monte de Piedad. The marker can be seen here to the left of the College of Saints Peter and Paul, to the left of the building's main entrance on San Ildefonso. N, 99° 7.742′ W. Marker is in Ciudad de Mexico, Ciudad de México. Marker is on Calle San Ildefonso just west of Calle Loreto, on the right when traveling west. Touch for map. Marker is at or near this postal address: San Ildefonso 60, Ciudad de Mexico, Ciudad de México 06000, Mexico. Touch for directions. Other nearby markers. At least 8 other markers are within walking distance of this marker. First Mexican Congress (within shouting distance of this marker); The High College of Saints Peter and Paul (within shouting distance of this marker); Manuel Cervantes Imaz (within shouting distance of this marker); Francisco Javier Clavijero (about 120 meters away, measured in a direct line); Captain Juan Chavarria de Valera (about 120 meters away); José Martí (about 120 meters away); Nidjei Israel Synagogue (about 150 meters away); Josefa Ortiz de Domínguez (about 150 meters away). Touch for a list and map of all markers in Ciudad de Mexico. More. Search the internet for First Monte de Piedad. Credits. This page was last revised on August 28, 2018. This page originally submitted on August 28, 2018, by J. Makali Bruton of Querétaro, Mexico. This page has been viewed 44 times since then and 5 times this year. 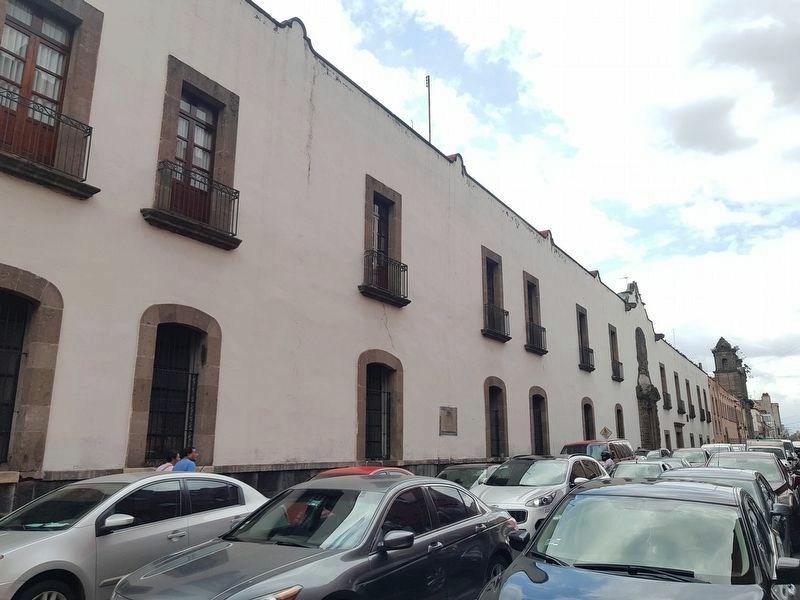 Photos: 1, 2. submitted on August 28, 2018, by J. Makali Bruton of Querétaro, Mexico.